Maybe you've heard—the economy is in trouble. That typically means people are losing their jobs. Which comes right before people lose their homes. When those people don't have a spacious car to move into or a generous aunt to crash with, their only option might be to move in to the inhospitable accommodations known as tent cities. Believe it or not, this recession has seen a surge in tent cities. While the numbers don't match up anywhere close to the days of Hoovervilles or even Reagan's tent cities, almost 61 percent of the country's homeless groups have seen a rise in homelessness since the housing crisis began in 2007, according to a report by the National Coalition for the Homeless. Here are just a few of the stories we've been keeping tabs on. 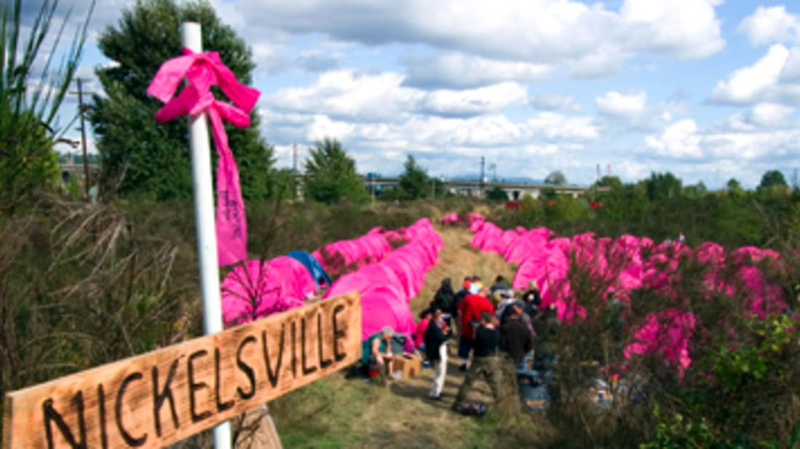 While most modern tent cities seem content to call themselves Tent City, the homeless in Seattle have honored Mayor Greg Nickels by naming their newest encampment Nickelsville. Located in a church parking lot, the city sprang up in late September and quickly evolved from a lawless encampment into a modern mini-city. Residents have established rules (no smoking, drugs or visitors between 9 pm and 7 am) and set up an arbitration council to mediate disputes. Despite its organization, Nickelsville and its 90-plus members haven't quite endeared themselves to city leaders who have demanded that it merge with another encampment (so there will only be one set of tented shelters within city limits). Some have also claimed that Nickelsvillians aren't actually homeless, but protestors with homes. Nick Hoffener, a 28-year-old Iraq War vet and Nickelsville resident, disagrees. "The mayor says everybody here has a home to go to; I don't understand it. I've slept on the doorsteps of churches and under bridges. I've slept in a lot of places. Here you don't have to worry about people coming to kill you." The Tent City in East Athens is growing so rapidly that earlier this year police had to ask its residents to move back into the woods and away from a road where passers-by could see them. Sitting on a plot of private land, the Athens encampment is over a decade and a half old according to "Radar," a 39-year-old resident who wasn't happy aboutÂ being asked to move. "Tent City has been here for 17 years, and all of a sudden we're in everyone's sight?" The number of residents in Athens' Tent City has fluctuated between the mid-single digits to as many as 30. A few months ago, a visitor found about eight people living there, one of whom voted. In January 2007, city officials raided a tent city near downtown St. Petersburg, slashing tents and attracting criticism. Not long after, an outdoor tent city called Pinellas Hope sprang up nearby, providing a place for many of the displaced to live. Today, run by Catholic Charities, Pinellas Hope is a thriving outdoor community for hundreds of homeless. Unlike the makeshift encampments scattered throughout the country, Pinellas Hope has millions of dollars in funding and requires residents to perform daily chores and meet regularly with caseworkers. The program seems to be working. Around 371 residents moved out in the camp's first five months and most found jobs and moved into their own homes. The facility has inspired officials in nearby Pasco and Hillsborough counties to discuss setting up similar tent cities. Reno's Tent City popped up around railroad tracks in the northern part of the city earlier this year when homeless shelters began overflowing. It didn't last long. City officials opened two new shelters last month and evicted the 160 Tent City residents. Why so many homeless in the Biggest Little City in the world? Blame the casinos. Out of a dozen people living in the Tent City interviewed by the Las Vegas Review Journal in October, six had come from out of state to find jobs at casinos, which have begun laying people off. The Reno Area Alliance for the Homeless estimates that 3,000 people around Reno are living in a temporary situation, which includes motels, shelters and the street. With a village council and elected officials, Portland's Dignity Village is like a city unto itself. And unlike many other tent cities, it's legal. Dignity Village won that distinction in 2004 when, after a four year campaign, the tent city was officially recognized as a campground. That designation meant that it was no longer violated city zoning laws. In 2007 Dignity Village, which is home to 60 people, entered into a management contract with the city that expanded the land it sits on and made it so residents have to pay for their own water and sewer service. It was the latest upgrade to the encampment that has evolved from tents on asphalt to walled structures built from two-by-fours and sheetrock. Down by Ventura Harbor there's a modest tent city run by homeless people for homeless people. Residents pay rent, follow a list of posted rules and perform chores. Rule breakers are evicted. The camp makes it a goal to move residents into conventional housing; so far, two dozen people have done so. Ventura Harbor is seen as a temporary space, providing homes for the homeless until the county provides 500 beds of supportive housing by 2012. The group living in and running Ventura Harbor, known as the "Dirty Thirty," was forced to relocate from the river bottoms in December 2004 and moved around 30 times. Some in government oppose the encampment while others say it's the best option for the homeless. "It works, and the residents deserve a huge amount of the credit," said Clyde Reynolds, director of the nonprofit Turning Point Foundation and a camp founder.